Many of the best recent German films have focussed on the horrific events of the early-mid 20th century, perhaps in an attempt to find meaning for the current generation. They include Downfall (Der Untergang), Sophie Scholl: The Final Days (Sophie Scholl – Die letzten Tage), Napola (Elite für den Führer) and the upcoming The Counterfeiters: these films inform our understanding of that time. A parallel movement is attempting to explore the perceptions of younger people, those untouched by the war or its after-effects; the fall of the Berlin Wall on November 9th 1989 means many 18-year-old Germans were not even alive to see the most visual of reminders of the Second World War. Fitting neatly into this second category is And Along Came Tourists (Am ende kommen Touristen). 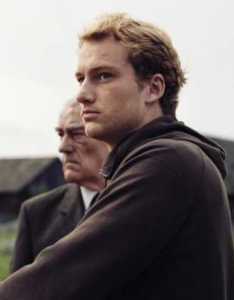 Newcomer Alexander Fehling is Sven, a young German who for his compulsory year of national service chooses Civil Service instead of the Army, and is posted to work in the youth hostel and visitor centre at the former Auschwitz concentration camp. His tasks are general and undemanding, although driving Mr Krzeminski (Ryszard Ronczewski) to his appointments and keeping him out of trouble may be more challenging than expected. Krzeminski is a former prisoner who remained at the camp, building up the conservation department and speaking to tour groups of his experiences. The exploration of various viewpoints is encouraged by using a naive young German as the vessel and then exposing him (and the audience) to different aspects of remembrance – his own preconceptions arrayed against the experiences of young locals for whom Auschwitz is just the town they live in, or those of Mr Krzeminski who cannot move beyond the debt he feels he owes to the dead. Robert Thalheim has crafted a subtle film, often using one or two lines of dialogue that will hint at one standpoint, or a brief sequence of events that will provoke consideration of another. It would be possible for these often disconnected ideas to come across as incoherent were it not for the strength of the direction. Performances are universally strong, with Fehling standing out in the lead – his Sven is entirely natural – while Ronczewski and Barbara Wysocka play their ‘enabling’ roles with skill and dexterity. Only Piotr Rogucki as Krzysztof struggles, but his character is not particularly well defined and it seems hard to hold the actor responsible. While audiences may one day tire of yet another German film dealing with the Holocaust, at least with they will find new thoughts on the era and how it may be reconciled with the present. This is a powerful, considered film that has been nominated for best film at the upcoming German Film Awards, and likely will be a highlight of the Festival of German Films.